…..Our Saint is going to pick Clopsy isn’t he…. I thiiiink we call this foreshadowing. Captain looks a little sad, maybe Colin can cheer her up. i just ralised because of this, HIS NOSE MAKES A FACE. That’s also true of Bully, and Dynamite. I think Clopsy is secretly evil. Just biding time, waiting to strike. 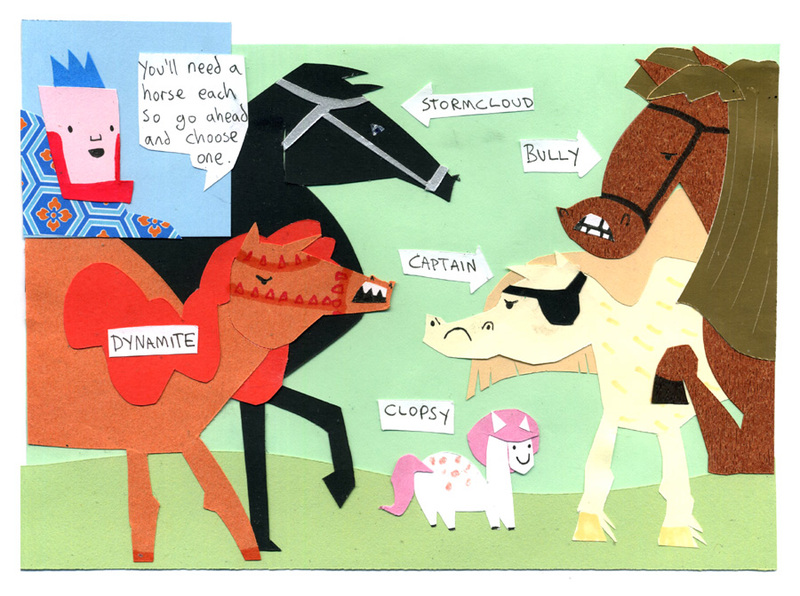 Colin, please choose your horse wisely. If you pick Clopsy, hope that the dragon has mercy on you. Aside from Clopsy, I like Stormcloud because he doesn’t look like he’s going to eat me. Also he’s pretty. maybe someone has done so already, but i’m predicting squire colin is going to make friends with the dragon after the other knights get crispified, and they’ll leave together (since colin got fired). I LOVE CLOPSY! I demand a Clopsy spin-off comic. It could be called My Clopsy Life! Lol i bet Colins going to choose clopsy. stormcloud is the best horse. he looks beautyfull and strong and healthy. he’s my favorite! What kind of a knight doesn’t already have a horse? !